This article will mean more to the users of the models 315, 319 and 329s. The Achilles heel of the Hurth gearboxes used in these cars tends to be the sloppy movement of the gear lever; a likeness to the stirring of a pudding comes to mind. No doubt when new these gearboxes were fine, indeed they were praised in the road tests of the day, but seventy years of use and abuse has had a detrimental effect upon their workings! When designed I have no doubt it was envisaged that the gearbox was for use in a left hand drive car. Sitting in such a car with the long gear lever alongside your right leg, selecting reverse (up and across to the left) was simple, first too was equally straightforward. Effectively you ‘lift’ the lever and place it in position; it is in fact a very sweet movement. Imagine, or even go and sit in your right hand drive car. Select first gear, I said first not reverse! Sorry, of course it is not easy because what you are having to do is push the long lever away from you and over to the left and up. Considering the lever is about 18” long you are in fact scribing an arc and asking the fulcrum ball in the top of the gearbox to carry out a function for which it was not designed. This where the problem lies. The lever has a machined ball where it emerges from the gearbox above which there is a spring, a curved dished washer. Over the whole there is cap which holds everything down to the gearbox lid. It is held down onto the lid by a threaded peg in the side. The peg has a 13mm hexagon head with an 8mm x 1mm thread, the last 6mm of the peg being machined to a diameter of 6mm, to locate in a machined slot in the side of the ball. 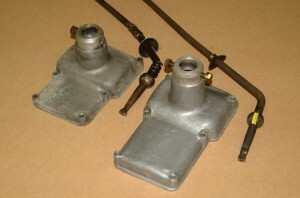 The gearbox lid is cast aluminium so the hole into which the peg is screwed is a steel insert to preserve the thread. The lever as we have said above is held down against the spring allowing the lever to move, but the peg becomes worn with the ravages of time and the movement less and less precise. The problem can be overcome by introducing a second peg on the opposite side to the first. If you have a chance to look at the Hurth ‘box fitted to the 328, 320 and the 321 it has this second peg as an original fitting. This ‘box differs in that it is slightly longer incorporating a centre bearing and a detachable bellhousing but with the same gear lever arrangement as the earlier cars with the exception of the added second peg. It is a relatively straight forward job to modify the original gear lever and gearbox lid. You only have to remove the lid while the ‘box stays in the car. The modification not only improves the selection of first and reverse but transforms the whole process of changing gear, it should become pleasurable again. First or reverse? 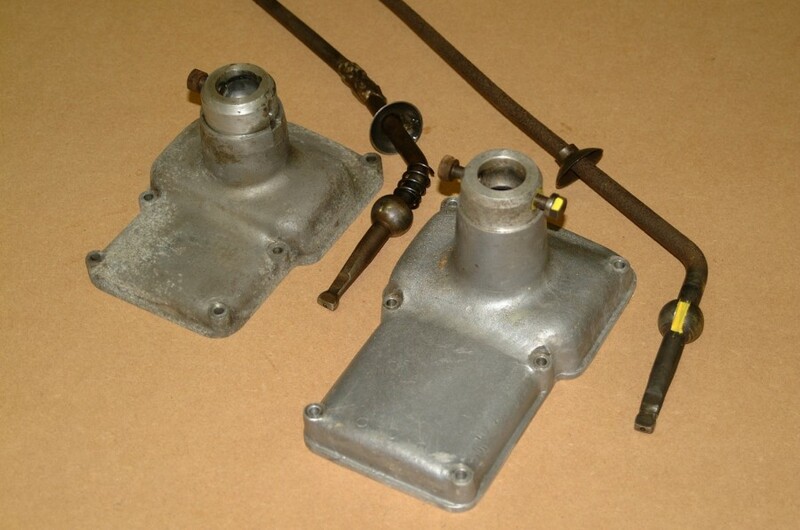 The short 315/319/329 gearbox lid with one peg and the longer 320 /321/328 lid, with the second peg and slot marked in yellow.